Another round. Speed junkies will get their full fix when it comes to F1 2012. The modern racing game shines with the usual pretty appearance and high speeds, in addition to the official license package. Find out which notebook hardware has enough power to master the game in this review. The developer and publisher Codemasters can be described as an expert in the area of racing games without a shadow of a doubt. Along with the Formula 1 series, the series DiRT and GRID (formerly DTM) are also part of the portfolio from the British studio. The years of experience in the field certainly make themselves noticeable in the released games. Although F1 2012 may not strictly adhere to the criteria of a bona fide racing simulation, the game is nevertheless still significantly more demanding than other racing game counterparts (Need for Speed, Burnout etc.). Technically F1 2012 is treading water somewhat. While the vehicle models and the advertising effects are quite impressive (especially the depiction of rain is stunning), latent shortcomings come to light beyond the track boundaries. One of these is the texture quality, which occasionally lags behind the current possibilities. Another is some polygons and other objects with low details. What is also a shame is that the track surroundings hardly provide any animations, making them seem a bit sterile. More track marshals or a few flocks of birds would not go amiss for example. The navigation also allows room for improvement: Although the main menu is able to impress with a very good look, the complicated and intricate submenus tend to get a little annoying with time. Meanwhile, the adequate engine sound is unfortunately not able to gloss over this shortcoming either. Since the free demo version doesn't have a benchmark included, we opted for the full version priced at about 40 Euros (~$51), which was kindly provided to us by Codemasters. 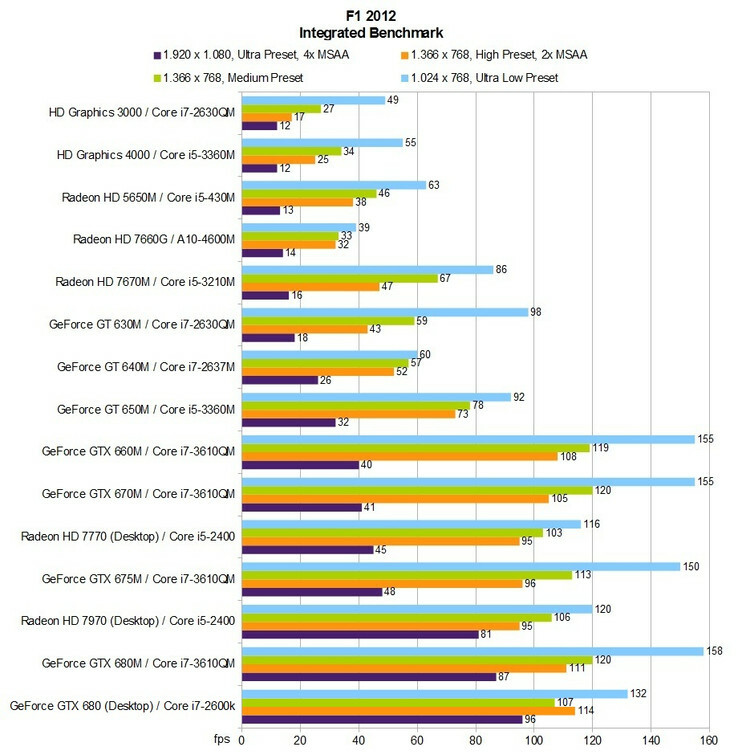 As with F1 2011, the included benchmark is located at the lower end of the graphics menu. During the over two-minute long sequence the KI drives one lap against 23 rivals, which represents a practical scenario. 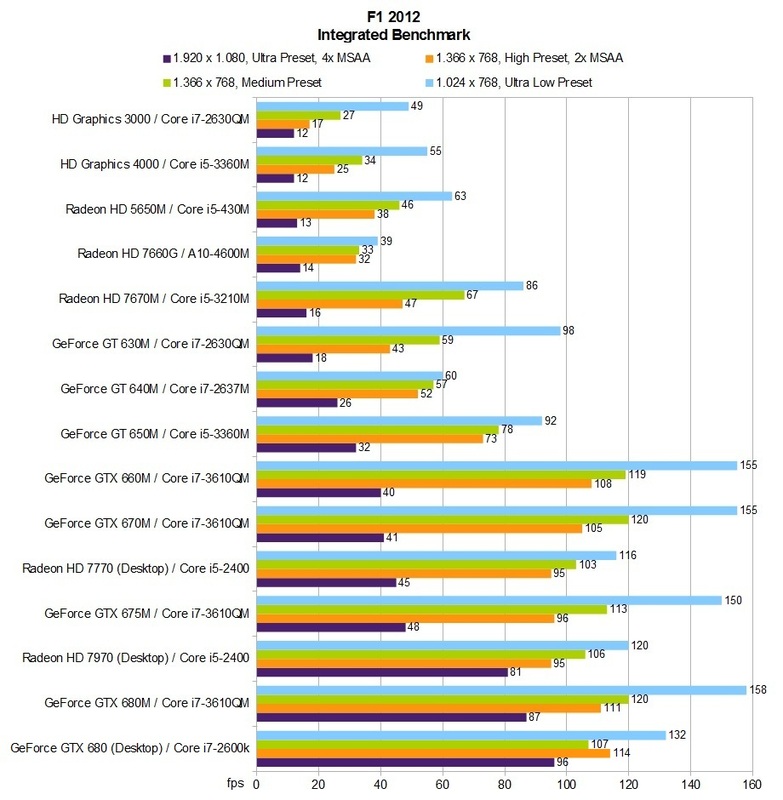 After the benchmark is complete, F1 2012 gives readings for the minimum and average frame rates. The latter of these was then always entered into our database. Praise is due to the developer for the comprehensive array of graphics settings. In the options menu there are almost 20 options available. Along with the resolution, the frame rate and the anti-aliasing (MSAA or EQAA), the vertical synchronization and the picture mode can also be set. Anti-aliasing is worth the while even if just for the menus (without AA a staircase effect is clearly visible). Those that don't want to spend ages searching for the perfect configuration of settings will be happy about the five global presets (Ultra Low, Low, Medium, High & Ultra). Advanced gamers are also able to adjust the individual graphics effects manually. Irritating: Some settings are only effective after a full restart. Since the game doesn't provide a corresponding message, this could possibly be a mistake. Unfortunately we had more bugs to deal with during the course of the test. The fact that F1 2012 sometimes crashed when shutting down (black screen) was another of the smaller problems. Significantly more problematic however, was the crashing on some devices while starting up - despite an up-to-date NVIDIA driver (ForceWare 306.23). Following a little Internet research, the culprit was quickly found: Deactivating the Steam Community (right-click on the game / >>Properties<<) solved the problem immediately. Things weren't quite as smooth with the Radeon HD 7970M, which still had to operate with a slightly out of date driver until the arrival of Catalyst 12.9 (Clevo 8.951.6.0). Using the AMD graphics card F1 2012 initially didn't want to start at all (the exe file showed as a process and not as an open application in task manager). We can only assume that the aforementioned problems will be resolved with the next set of patches and driver version. For those that want to enjoy F1 2012 in its full glory, a graphics card from the high-end segment will be necessary. 1920x1080 pixels and the Ultra Preset (inc. 4x MSAA) are provided to a decent standard from a GeForce GTX 660M upwards. Mid-range notebooks don't have to relinquish good appearance either though. Thus a GeForce GT 630M or a Radeon HD 7670M already cope well with high details, 2x MSAA and a resolution of 1366x768 pixels. The graphics chip in the current Ivy Bridge generation (HD Graphics 4000) meanwhile only manages to process medium details to a decent standard. Owners of Intel's HD Graphics 3000 will have no choice but to come to terms with low settings. As can be seen on the comparison pictures, F1 2012 compromises considerably in terms of the atmosphere when using the preset "Ultra Low". Along with the shadows, the illumination and the textures, primarily the reflections suffer. The audience and the drivers are completely obscured, and the rear view mirror only shows a gray surface. From the medium preset the graphics quality improves significantly. A score of "Good" is only attributable to the game at the highest level with anti-aliasing enabled. Not considering the new racing mode, Codemasters hasn't been daring enough to embark on any extensive experiments with F1 2012. Gamers that are looking for a successful symbiosis between arcade and simulation should definitely take a closer look at the game. In our opinion the developer could have invested a bit more effort into the appearance though. Despite the above average quality, the EGO engine is already a bit dusty in the meantime. Those that have already purchased the predecessor won't necessarily have to get their hands on the latest version. Thanks to the moderate hardware requirements, even a mid-range notebook should prove to be sufficient for a decent performance. The driver versions of the aforementioned notebooks: 306.23 (Nvidia), 8.951.6.0 (AMD) and 8.15.10.2761 (Intel).